Its English name derives from the Portuguese name for the fruit of the cashew tree caju (Portuguese pronunciation: [kaˈʒu]), which itself is derived from the Tupian word acajú, literally meaning “nut that produces itself”. The generic name “Anacardium” (derived from Greek ἀνά (aná), meaning “outside,” and καρδία (kardía), meaning “heart”, refers to the unusual location of the seed (the heart) outside of the fruit. The fruit of the cashew tree is an accessory fruit (sometimes called a pseudocarp or false fruit). What appears to be the fruit is an oval or pear-shaped structure, a hypocarpium, that develops from the pedicel and the receptacle of the cashew flower. Called the cashew apple, better known in Central America as marañón, it ripens into a yellow or red structure about 5–11 cm (2.0–4.3 in) long. It is edible and has a strong “sweet” smell and taste. In 2017, global production of cashew nuts (as the kernel) was 3,971,046 tonnes, led by Vietnam, India and Côte d’Ivoire with 22%, 19%, and 18% of the world’s total respectively(table). 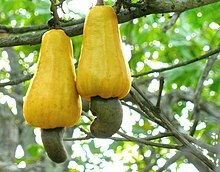 Benin, Guinea-Bissau, Tanzania, Mozambique, Indonesia, and Brazil also had significant production of cashew kernels. In 2014, rapid growth of cashew cultivation in Côte d’Ivoire made this country the top African exporter. Fluctuations in world market prices, poor working conditions, and low pay for local harvesting have caused discontent in the cashew nut industry. ^ a b c d e f g Morton, Julia F (1987). “Cashew apple, Anacardium occidentale L.” Fruits of warm climates, Julia F. Morton. Center for New Crops and Plant Products, Department of Horticulture and Landscape Architecture, Purdue University, W. Lafayette, IN. pp. 239–240. ISBN 978-0-9610184-1-2. Archived from the original on 2007-03-15. Retrieved 2007-03-18. ^ “Cashew”. Department of Horticulture, Cornell University. 20 October 2015. Retrieved 16 March 2019. ^ Carolyn Joystick, “Cashew Industry” in Encyclopedia of Latin American History and Culture, vol. 2, p. 5. New York: Charles Scribner’s Sons 1996. ^ Jostock, “Cashew Industry”, p. 5. ^ Varghese, T.; Pundir, Y. (1964). “Anatomy of the pseudocarp in Anacardium occidentale L.”. Proceedings of the Indian Academy of Sciences, Section B. 59 (5): 252–258. ^ Rosen, T.; Fordice, D. B. (April 1994). “Cashew Nut Dermatitis”. Southern Medical Journal. 87 (4): 543–546. doi:10.1097/00007611-199404000-00026. PMID 8153790. ^ Osborn M (26 August 2015). “Access to Market Data and Supply Chain Visibility offer Economic Boost to Ghana Cashew Farmers”. Consumer Goods Technology. Archived from the original on 2016-06-04. Retrieved 11 May 2016. ^ Edi Souza (2018-07-28). “It’s cashew time at the fair and on the plate (translated)” (in Portuguese). Folha de Pernambuco. Archived from the original on 2018-08-21. Retrieved 2018-08-21. ^ Rosen T.; Fordice, D. B. (1994). “Cashew nut dermatitis”. South Med J. 87 (4): 543–46. doi:10.1097/00007611-199404000-00026. PMID 8153790. ^ “Why Cashews Aren’t Sold In The Shell”. Moment of Science, Indiana Public Media. September 6, 2013. Archived from the original on 2016-02-20. Retrieved 2016-02-22. ^ a b c d Hamad F. B.; Mubofu E. B. (2015). “Potential biological applications of bio-based anacardic acids and their derivatives”. Int J Mol Sci. 16 (4): 8569–90. doi:10.3390/ijms16048569. PMC 4425097. PMID 25894225. ^ “FAOSTAT of the United Nations”. FAOSTAT of the United Nations. Archived from the original on 7 January 2019. Retrieved 7 January 2019. ^ Bavier, Joe (29 October 2014). “War-scarred Ivory Coast aims to conquer the world of cashews”. Reuters. Retrieved 9 February 2015. ^ “Tanzania riots over cashew nut payments”. BBC. 24 April 2013. Archived from the original on 2013-05-21. Retrieved 14 May 2013. ^ Lamble L. (2 November 2013). 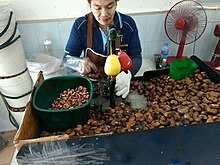 “Cashew nut workers suffer ‘appalling’ conditions as global slump dents profits”. The Guardian. Retrieved 6 September 2015. ^ Wilson B. (4 May 2015). “‘Blood cashews’: the toxic truth about your favourite nut”. The Telegraph. Retrieved 6 September 2015. ^ “Cultivating Cashew Nuts”. ARC-Institute for Tropical and Subtropical Crops, South Africa. Archived from the original on 2015-02-21. Retrieved February 15, 2015. ^ a b c d “Full Report (All Nutrients): 12087, Nuts, cashew nuts, raw, database version SR 27”. Agricultural Research Service – United States Department of Agriculture. 2015. Archived from the original on 2015-08-18. Retrieved 6 August 2015. ^ a b McWilliam V.; Koplin J.; Lodge C.; Tang M.; Dharmage S.; Allen K. (2015). “The prevalence of tree nut allergy: a systematic review”. Curr Allergy Asthma Rep. 15 (9): 555. doi:10.1007/s11882-015-0555-8. PMID 26233427. ^ a b c “Cashew Allergies”. Informall Database – funded by European Union. 2010. Archived from the original on 29 October 2010. ^ “Food Allergies – INFOSAN” (PDF). World Health Organization. 2006. ^ “Cashew Oil”. Smart Kitchen. Retrieved February 15, 2015. ^ a b Alexander H. Tullo (September 8, 2008). “A Nutty Chemical”. Chemical and Engineering News. 86 (36): 26–27. doi:10.1021/cen-v086n033.p026. ^ a b c “Exposure and Use Data for Cashew Nut Shell Liquid” (PDF). United States Environmental Protection Agency. Archived from the original (PDF) on 2013-05-12. Retrieved 2012-01-12. ^ Ferri, Enrico (22 May 2011). “Bioresins Derived from Cashew Nutshell Oil”. MaterialsToday. Archived from the original on 2015-09-10. Retrieved 7 September 2011. ^ a b Strom, Stephanie (2014-08-08). “Cashew Juice, the Apple of Pepsi’s Eye”. The New York Times. ISSN 0362-4331. Retrieved 2015-11-24. Jostock, Carolyn. “Cashew Industry” in Encyclopedia of Latin American History and Culture, vol. 2, p. 5. New York: Charles Scribner’s Sons 1996. Olaya, Clara Inés. “Cajú/ Marañon/ Merey/Acaiu/Cashew Nut”, in Americas 42, no. 3 (1990), 52–53.